University of Cincinnati geologists  who routinely find themselves between a rock and a hard place when collecting research samples  have become the inspiration for prototype designs created by faculty and students in UC's nationally ranked College of Design, Architecture, Art, and Planning. The designs currently underway are intended to make research field work and living conditions more comfortable and more efficient. The prototype designs will be tested in the Himalaya range this September by a team of UC geologists, designers and an engineer. During this upcoming trip to the Himalaya in northern India, UC will be testing a very lightweight, compact-when-collapsed sleeping platform and a very thin (thus very portable) but very warm sleeping bag. Another trip is expected for next summer when additional or more advanced designs will be tested. According to Brian Davies, associate professor in the School of Architecture and Interior Design and head of the Design for Extreme Environments Project (DEEP), this latest challenge involves design faculty and students; geology faculty and students; and engineering faculty and students. The design project is rooted in ongoing climate change research by UC geologists in the Himalaya. As part of that climate research, the scientists are collecting rock and soil samples for testing using geochemical techniques. Slowing down that work is the fact that the geologists have to set up a base camp where the terrain is relatively smooth, a three-hour hike from the rocky glacial terrain where they will find the samples they need. "And that means we spend more time hiking than doing actual work related to our research," explained Lewis Owen, professor and head of UC's top-ranked geology program, adding, "If we hike for three hours one way in order to reach the site for field work, that means we're spending six hours a day hiking and about three to four hours a day doing the work we came to do." What if they could carry very lightweight, durable, warm equipment with them in order to set up a mini-camp on rocky terrain? The goal being to hike to the work site, spend six to eight hours working, spend the night, work long hours again the next day and then return to the base camp. In effect, at least doubling their work time. 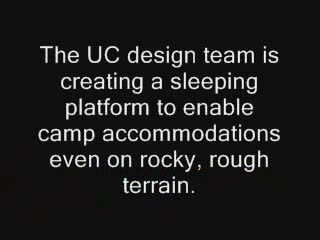 The solutions developed by the multi-disciplinary UC team include a super-thin sleeping bag  weighing less than two pounds  and designed to increase thermal conductivity (ability to hold heat) as necessary. 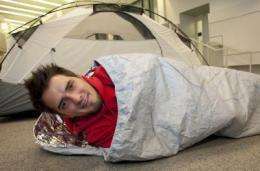 Said team member Jon Lowry, a just-graduated master's student in design, "The concept for the sleeping bag is similar to the 'to go' pizza carrier or heat-resistant mylar oven mitts, now produced in the form of a sleeping bag that can roll up much smaller and thinner than a traditional bed roll." The design of the sleeping bag reflects body heat back into the bag's interior, negating the need to rely on fabric thickness and volume for warmth. And a thin, lightweight, waterproof bag is one that is very portable indeed, according to Davies, but while also providing warmth for sleeping in temperatures that will be as low as 0 degrees Fahrenheit at the 16,000 feet elevation where the team will be working. According to Davies, "The human body produces much less body heat at higher altitudes. The average human body produces 116 watts of heat energy at sea level but only about 70 watts of heat energy at about 14,000 feet in elevation. To help cope with this reduction in body-heat production, we want to enhance the energy efficiency of capturing body heat at high altitudes. Typically, anywhere from one to up to six percent of body heat is effectively captured at high altitudes. Our goal with our innovative sleeping bag is to capture over 50 percent of the body heat produced at high altitudes." In terms of design, the exterior of the sleeping bag is strong, durable, water-resistant rip-stop nylon. The interior layers of the bag consist of a "sandwich" of breathable polyester and mylar  the breathable polyester necessary to keep the user from becoming soaked in sweat. And in fact, if users of the bag find themselves retaining too much warmth, venting options are built into the bag: foot and head compartments than can be opened as well as zippered vents along the body of the bag. The terrain itself was the next problem since it is impossible to set up a standard tent on the rough, rocky terrain of a glacier. 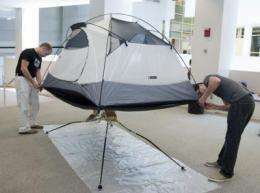 So, the UC team has created a very lightweight platform that will provide a level surface for sleeping, fitting a standard 7.1-foot-long, 4.6-foot-wide domed tent. The platform, which can hold the body weight of a 200-pound individual, can collapse down into a four-pound, portable unit. When combined with the tent, the entire portable platform/tent unit weighs about six pounds. "Given that we will be working at low-pressure elevations where the oxygen content is less, and so, human lungs must work harder to function, creating truly lightweight tools was very important," said Davies. Both items to be tested  the thin sleeping bag and the collapsible sleeping platform  could have other applications and markets, in that users for these devices and technologies could extend beyond researchers in extreme environments. Or, the prototype technology could be integrated with already available products.